Who took home Hockey East Hardware? Tuesday Liam and Matt gave their predictions for the Hockey East Awards. Thursday, the league announced who the real winners of the awards were and they are listed below. None from the current crop of players on the No. 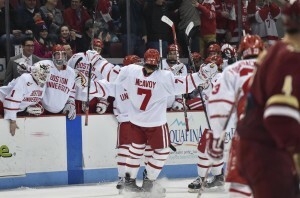 7 Boston University men’s hockey team was on the 2012 BU team that lost to Boston College in the Beanpot championship in overtime. This year’s seniors were still a few months removed from Commonwealth Avenue when BC forward Bill Arnold scored the game-winning goal at TD Garden. But four years later, this year’s team is pretty engrained in the Beanpot tradition, and now well acquainted with a similar heartbreak. A scoreless, physical game throughout Monday night, No. 3 BC finally broke through 1:57 into overtime when Alex Tuch wristed home the first and only goal, defeating BU 1-0 in the Beanpot title game. BC (20-4-4, 11-1-4 Hockey East) has now won the Beanpot five times in the last six years. It was scoreless for almost 62 minutes, but that’s not to say there isn’t a lot to talk about. We’ll break this one down in this Beanpot championship Pluses and Minuses. Senior netminder Sean Maguire was on his game throughout the title game and really the entire Beanpot Tournament. BC had a good deal of chances throughout the first three periods of the game, but Maguire stood on his head just about every time. One of the few times Maguire didn’t see the puck, though, things went wrong for BU (16-8-4, 9-4-3 Hockey East). After both teams tried to get their legs back at the beginning of overtime, the Eagles got the first real opportunity about two minutes in and made it count. As Tuch skated into the high slot area, BU’s defense tried to contain him before he could shoot, but the bodies standing in front of Maguire caused an unintentional screen, setting up an unpleasant result. Against a rival like BC, and in a game of importance such as this one, it’s generally pertinent to get things started in the first period on the right foot. The Terriers, however, did not have one of their better opening periods on Monday night. One thing that stands out right away on the shot chart is the fact that BC not only attempted 32 shots in the opening stanza, but a majority of them came in the slot and home plate area. Life was not easy for Maguire, to say the least. BU was mostly kept to the outside of the faceoff circles and did not really kick things into gear until the second period. For anyone who’s watched a BU-BC, you know it can get chippy and downright nasty during and after the play. This one was no different, especially on the BU end of things. 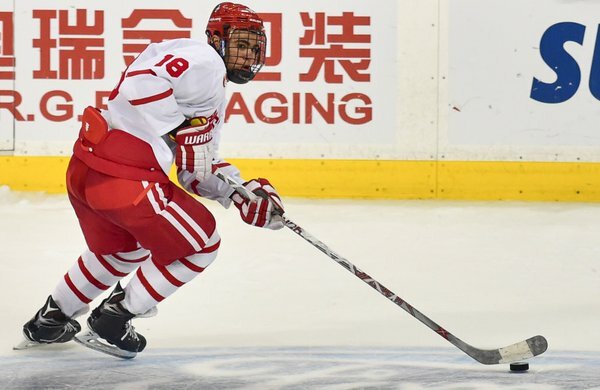 Freshman forward Jordan Greenway seemed to be in the middle of it all on Monday, drawing the ire from a lot of the BC contingent in the arena. Greenway was involved in a play in the third period in which BC goalie Thatcher Demko was knocked down for a few minutes, and he also drew three penalties during one scrum in the second period, including a 10-minute misconduct. BU killed off all of the penalty time, but was without Greenway’s presence until early in the third period. BU’s offense could not muster a goal in what turned to be Demko’s ninth shutout of the season (a new single-season BC record), but the real issue tonight was the lighting at TD Garden. With 8:53 to play in the first period, the main lights above the ice slowly dimmed and then turned out. The teams skated around the ice to stay loose, but were eventually sent back to their respective dressing rooms. The situation was finally resolved after nearly 30 minutes, but it took longer than a normal intermission to get the lights up and running. BC head coach Jerry York said after the game said both teams were offered the chance to play a 29-minute second period instead of finishing the first, but York said he and Quinn declined the opportunity. We’ve mentioned it in this article a few times already, but Maguire was good in this one — really good. He kept BU in the game with 23-first period saves and finished with 41 stops on 42 chances. Maguire, for the tournament, saved 65 shots on 67 opportunities for a .970 save percentage. He wouldn’t carry the Beanpot trophy, but he did earn Beanpot MVP and the Eberly Award for the highest save percentage in the tournament. The only two goaltenders to have a higher single-tournament save percentage than Maguire were former BU netminders John Curry (.985) and Rick DiPietro (.981). Sarah will have more on Maguire’s stellar performance in her sidebar. The first period was not one BU will be writing home about anytime soon. The rest of the game, especially from a defensive standpoint, the Terriers did a much better job in their own end. BU pushed the Eagles to the perimeter and limited the number of “Grade-A” opportunities they could get on net. By game’s end, the total shot attempts were closer than the first period may have indicated, with BC holding a slight 68-62 edge. The standings will say it was a tie. In about as evenly matched a game as you’ll see, No. 10 BU and No. 4 BC skated to a 1-1 tie in the second game of a home-and-home series. The Terriers gained a lead midway through the second period with a goal from senior captain Matt Grzelcyk and looked poised to come away with a win, but BC forward Ryan Fitzgerald knotted things up with a bar-down strike with 2:05 left in the third period. Back-and-forth action with a lot of chippy play made this one a fun and exciting one to watch. We’ll break down the 65 minutes in this Pluses and Minuses. Injuries have limited Grzelcyk to just 10 games this year — less than half of BU’s total number. But that’s been really the only thing getting in the way of BU’s (11-7-4, 5-4-3 Hockey East) captain, because when he’s been on the ice, he’s been a solid force at the blue line. With the game scoreless on Saturday night, Grzelcyk was in perfect position to redirect a shot from senior assistant captain Danny O’Regan past Thatcher Demko. It was Grzelcyk’s seventh goal of the season and 12th point in his 10 games played. He played well on the defensive side, too, staying on his assignments and closing any gaps. Now that Grzelcyk’s getting healthier and more playing time, Quinn said he’ll continue to be a force on both ends of the ice. Not much separated senior goaltender Sean Maguire from a shutout, but a well-placed BC (15-4-3, 8-1-3, Hockey East) screen and shot ended any chance of that. But that’s not to say Maguire didn’t play well. The senior was in good position all night, making a few terrific saves to stop BC odd-man rushes. In all, Maguire finished with 38 saves. Sarah will have more on his game in her sidebar. Less than 22 hours after a power-play goal decided Friday night’s fate, the Terriers got a chance to right the ship on the penalty kill. Freshman forward Jordan Greenway and sophomore defenseman John MacLeod were called for successive penalties halfway through the first period, and BU was forced to kill of an extended 5-on-3. The penalty-unit came up big, as it did the other three times on the night, going 5-for-5. It wasn’t as if BC didn’t have chances on goal (eight power-play shots), but the Terriers limited grade-A shots, and the ones that were good opportunities, Maguire was generally there to make the stops. As noted before, Maguire was on his game from start to finish. However, his defense didn’t make his life easy. BC had numerous odd-man rushes — like the 2-on-1 in the second period that forward Colin White nearly scored on — and 39 total shots. There were sequences in the game, which York even said afterward, where both teams sort of lost their way and let the opposition get good shots at the net. It wasn’t as if this happened the whole game, but if Maguire hadn’t been playing so well, the score might have been different. BU’s penalty kill was good and BC’s matched up just as well. Like the Eagles, BU had five opportunities with the man advantage but could not convert. The first two opportunities for the Terriers looked good, though they didn’t score. The problems came after those first two tries, as the Eagles made life tough in the neutral zone on BU entries. The power play wasn’t awful, but a goal with a man up could have gone a long way. For 60 games, sophomore defenseman Brandon Fortunato never once sat in the penalty box. In back-to-back games against BC, Fortunato became much more acquainted with the sin bin. Fortunato took his second penalty of his collegiate career on Saturday with a holding call in the second period. CHESTNUT HILL — After a back-and-forth matchup (My recap of the game is here), the Boston University men’s hockey team eventually fell to Boston College by a score of 5-3. We anticipated it would be, as always, an entertaining game — and we certainly got that. There were a whole lot of takeaways from that game, too, and we’ve spelled out just some of the things we liked and didn’t like below. While the game was relatively even for the most part when the sides weren’t utilizing their special teams units, there were elements to BU’s game that did give BC an advantage. For one thing, the Eagles had a pretty easy time in transition, skating through the neutral zone with relative ease and, at times, on odd-man rushes. Lane said BU would take measures to eliminate that from its game heading into Saturday’s contest, beginning with skating more. A couple months ago, the three of us here at the Boston Hockey Blog joked about Jerry York getting his 1,000th career win against BU. How fitting would that be? At the time, we assumed he’d have passed 1,000 wins by the time this rivalry series rolled around, but after a 1-3-1 record in December, it became pretty clear that York would have a pretty good shot at 1,000 against the Terriers. And he got just that much closer with his 999th win on Friday. If BC wins Saturday at Agganis Arena, then that’ll do it. York insisted after Friday’s game that the win total was just a number and that he wasn’t paying particular attention to the accolade, but it’s not like it’s an insignificant accomplishment. It makes the stakes in Saturday’s game just that much higher, and while a sweep would be bad for BU anyway, this adds that much more pressure. While it proved to be pretty insignificant in the grand scheme of the game, sophomore defenseman Brandon Fortunato did something Friday he hadn’t done in a college game before: He took a penalty. Yep, after going an entire season last year, and 20 games this year, without recording a penalty, he ended that streak with a tripping call 9:50 into the first period. All good things must come to an end, I guess. BU was able to capitalize on three different power plays for goals, and special teams were basically the story of the evening. Judy has more about that in her sidebar. Though there were a bunch of things to dislike about the loss, one of the brighter spots was senior forward Ahti Oksanen getting his 100th collegiate point. The winger had 98 points coming into Friday night on 46 goals and 52 assists through 131 games. In his 132nd, Oksanen recorded an assist on freshman center Jakob Forsbacka Karlsson’s first-period power-play goal for his 99th point and then got a power-play tally of his own in the second for his 100th. As has become typical this season, Forsbacka Karlsson impressed during Friday night’s game. The freshman was one of three Terriers with multi-point efforts (the others being Oksanen and senior assistant captain Danny O’Regan), registering a goal in the first period and an assist in the second. He also blocked a pair of shots and was, as usual, a large part of BU’s penalty kill. But his traits that don’t necessarily appear on the scoresheet were in full view as well, like his neutral-zone stick-lifts and overall play-making abilities. He accounted for six of BU’s 49 total shot attempts and drew a penalty as well. As some of our readers know already, we like to give props where props are due, especially when it comes to off-ice entertainment and accomplishments. And BC’s crew goes all out with its graphics and marketing. You can check out a lot of their .gifs and other graphics on their Twitter account. We especially liked this .gif with the team’s lineup. BC’s intro video was as good as we’ve seen all year, and the mid-game hype videos were on point (anytime “Hotline Bling” is involved, we’re happy). On top of that, TD Garden organist Ron Poster was on hand at Conte for some live music to add to the experience. Overall, regardless of rooting interests, you can’t say that BC doesn’t know how to provide some great entertainment.